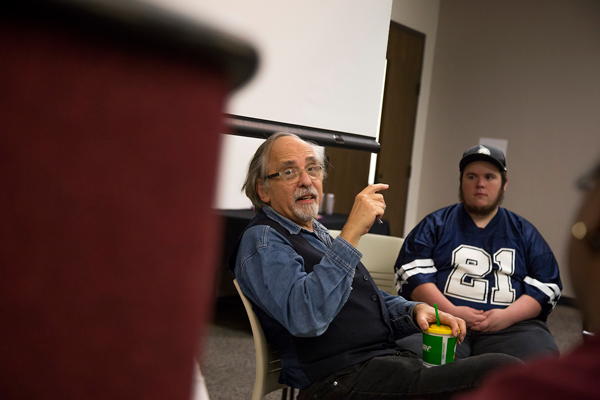 College dropout and Pulitzer Prize winner Art Spiegelman said in a lecture at Eastfield on Thursday that he learned everything he’s ever known from comics and comic books. Eastfield’s 2018-2019 common book about the Holocaust, “Maus,” was Spiegelman’s breakout success besides working for Topps and The New Yorker. He said that his Pulitzer prize-winning graphic novel, “Maus,” is something that has consumed his life with how much it has affected him and the legacy of his family. He wrote “Maus” in such an informal style because it felt most natural to him as a cartoonist. During his time working for Topps, he co-created the Wacky Packages and Garbage Pail Kids series. After “Maus” was published, he spent 10 years as a contributing artist for The New Yorker. Spiegelman used his sense of humor to share his thoughts on racism, President Trump, the power of comics and the dangers of censorship during his 90-minute presentation. He even poked fun at Eastfield’s common book committee. “I’m insulted that they put this as a ‘common’ book,” Spiegelman said. Spiegelman said the entire process of developing “Maus” took 13 years. He wrote another book, “MetaMaus,” which describes the intimate details of how “Maus” was made. “Maus” was heavily influenced by Spiegelman’s family, and features his father, Vladek Spiegelman, as the main character. In the book, Spiegelman expresses his struggles after his mother’s suicide, his strained relationship with his father and the specter of his older brother, who died in the Holocaust before Spiegelman was born. While Spiegelman wasn’t afraid to frequently use obscenities and insults during his presentation, Megan Horlander, Eastfield librarian and common book committee co-chair, said the tragedy of the Holocaust is what impacted her most. “I think the biggest thing that hit me was when he showed [his] family tree and how few people were left after the war,” Horlander said. Horlander said the amount of empty space on the tree after six years was horrifying. “To have that many people in your family die in that short of time, and most of them died in 1942, it’s unbelievably sad,” she said. Sabine Winter, an English professor born in Germany and also a co-chair of the common book committee, visited the Dallas Holocaust Museum one month prior to Spiegelman’s lecture. The Dallas Holocaust Museum has a wall that houses family trees of Dallas Jews, and some of those records are simply blank walls, she said. So many of the deaths of the Holocaust happened in 1942 because the Nazis essentially industrialized their methods of killing people, Winter said. Spiegelman warned the audience that the current U.S. political climate was something to be wary of. He stressed the importance of the youth vote for the upcoming midterm elections. Spiegelman made a connection between the burning of books in Nazi-controlled Germany and the burning of comic books in post-WWII America. Spiegelman presented the crowd with images of American public-school librarians, teachers, PTAs and religious groups banding together to mass-burn comic books in 1948. These comic book burnings came to a head in 1954 when the issue of “vulgar” and “indecent” images being presented to children through comic books was debated in the U.S. Senate. Spiegelman said these events, along with many other low points in American history, led to the polarized political climate that Americans live in today. 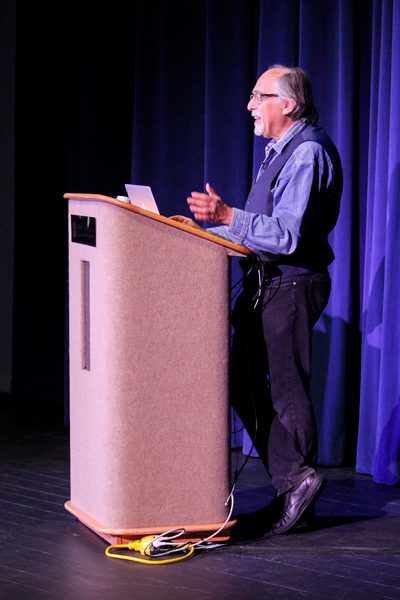 “The FBI, mainstream journalists and Democrats may be minor demons, but how did America fall so far that we let Joker become president?” Spiegelman asked the audience during his presentation. Winter said that the Rohingya persecution in Myanmar is a perfect example of how genocides continue throughout the world, despite how little the public knows about them. Society has forgotten that genocides haven’t gone away. They’ve only gone on with less exposure to the world, she said. Even before the Holocaust, there were other ethnic cleansings like the Armenian Genocide, and it is difficult not to repeat the mistakes of these tragedies without learning what happened in them, Winter said. Dixie Riser, an education major, said she loved Spiegelman’s presentation and the way he casually poked fun at Trump. Riser read “Maus” and said the most memorable panel in the book was that of other Jewish mice being publicly hanged in Nazi-controlled Poland.